There are tons of online video converters on online market. If you want to convert a large batch of files, free online video converter would be an excellent option for you. As there are so many different video formats such as MKV, 3G2, MOV, WMV, MP4, AVI, MPEG, we need to convert the files so that they can be read and played by the device. If, for your work or your studies, you want to convert and often edit video files, the most reasonable thing is to install a specific program on your computer that gives you more possibilities. If it is something specific, there are also numerous websites that give you the possibility of doing the conversion online, quickly and easily. Almost all of these sites are free, but some can be extremely slow, bombard advertising or add watermarks to your videos. Therefore, we have selected 5 free tools to convert online videos that are very easy to use and fulfill what was promised. It’s available for Windows and Mac OS. Apowersoft is undoubtedly one of the best free online video converters. The best thing about Apowersoft is not only its conversion speed and compatibility with most mobile devices, but also it allows you to edit, include the effects or filters, adjust the volume or rotate the image to customize the videos before changing the format. With this tool, you can convert videos to a wide range of resolutions -from 144P to 1080P- and you can also save special output sizes (such as 16: 9, 4: 3, 3: 2, etc.) for devices including the PSP or the iPhone. Another great advantage is that it is capable of handling multiple videos at once which are organized in a conversion queue. Of course, you can use it for the same configuration; if you want to convert to different formats, you must do it independently. To use the online version (free), choose on the home page the option “Select files to start ” and not “Download desktop version” since the latter is the premium tool. ClipChamp is another popular video converter. It has a recent change but not a good enough. It allows you to convert an unlimited number of videos you want with any size, format and input resolution such as 240p, 360p, 480p, 720p, 1080p, 4K and other non-standard options. It also allows converting to MP4, WebM, ASF (WMV) or FLV. The conversion to WMV is very good for playing videos in PowerPoint. Besides, if you need to convert many videos at the same time, it offers you a batch entry option (requires the use of an extension for Chrome). It also includes editing tools (more basic than Apowersoft) to tune the video before converting it. This is an excellent file converter which has the ability to manage more than 200 file types. The most incredible thing about this free application is that it allows the conversion of more than 140 different audio formats, AutoCAD, text documents, images, video, PowerPoint presentations, spreadsheets, and e-books. You will even be able to convert among a multitude of compressed file formats such as rar, ace, zip or 7z. As we have said, it is a web service; therefore, you don’t have to install any kind of software on your device. You simply have to upload your files to CloudConvert and the process will take place automatically. It should be noted that although the process is carried out in the cloud, your data will not run on any risk. The free version will give you limits to 25 ‘conversion minutes’ per day. 123apps is a set of online applications with which you can work directly from the browser your audio and video files to perform different tasks with them. Online Audio Converter: it allows converting audio among different formats such as mp3, m4a, wav, ogg, m4r, mp2, flac, or amr. Online Audio Cutter: A simple tool to cut an audio file to the length that you want. Online Audio Joiner: This application allows you to join several audio files into one. Online Voice Recorder: An intuitive and very easy to use the voice recorder, you just have to verify that our microphone works, and just by clicking on the record button, we can save our audio easily. 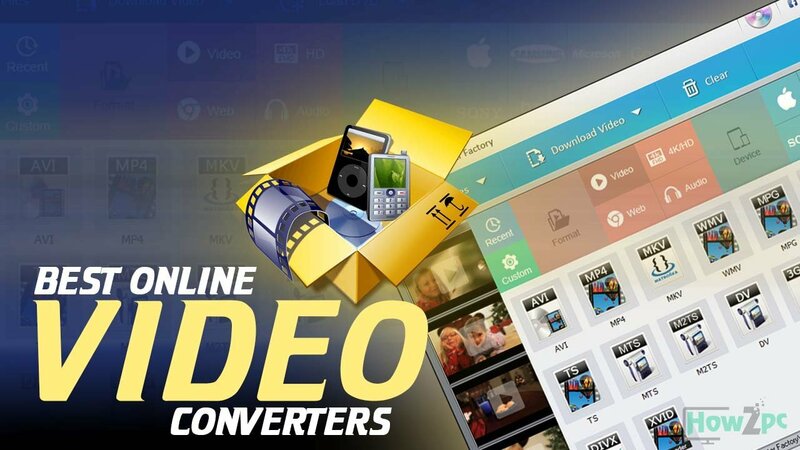 Online Video Converter: Thanks to this tool, you can convert videos among different formats. Currently, it supports the most popular formats such as MP4, AVI, MPEG, FLV, 3GP. You can also extract only the audio and save it in OGG, MP3, Wave, FLAC or other formats. Online Video Cutter: You can cut a video to only the part that interests us, either uploading a file from our computer or adding a URL of it. It should be noted that for using the tools of 123apps, you shouldn’t need to install anything on the PC, you should only have a web browser and an acceptable Internet connection, plus the use of them does not require any cost because they are completely free. If you’re looking for converting video files but at the same time you don’t want to edit, just have a look at Convert to Video Files Online. Actually, it’s a free version that comes with a great selection of conversion formats such as MP4, MOV, WMV, MPG, and more. The good thing is that it has 4 quality options where most of the converters supply only three. Although you won’t find any sort of advanced editing tools, you could resize the video if it is necessary. The other thing is that processing might disappoint you because it’s really slow. But this online video converter can be an excellent option if you just need a specific format for a specific application.